GOVERNMENT AFFAIRS CP STAFF LABORERS' PROD GOP LEADERS ON HIGHWAY BILL A multi-media campaign from the union representing plant and jobsite workers across the transportation infrastructure value chain spotlights the public safety cri- sis crumbling bridges, deteriorating roads and struggling transit systems pose. 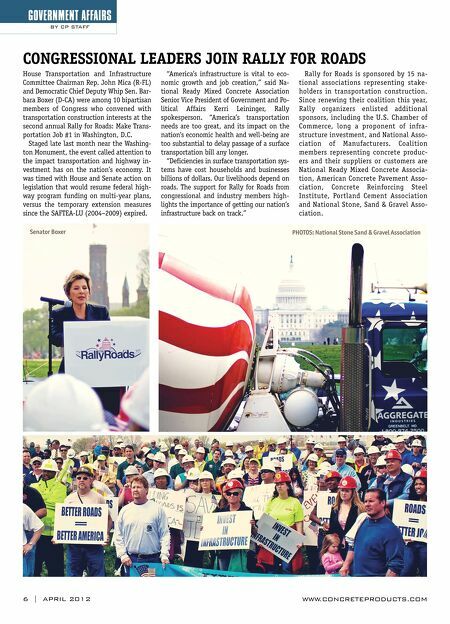 The La- borers' International Union of North America undertaking is especially targeted at voters positioned to prod U.S. House Speaker John Boehner (R-OH) and Senate Minority Leader Mitch McConnell (R-KY) into supporting a long-term highway bill that protects invest- ment in transportation systems. With graphics and audio files posted at www.highwaybill.org, the provocative cam- paign includes: • Extensive radio spots in Ohio and Ken- tucky, the first, "London Bridge," fea- turing children singing "America's bridges falling down." A second, harder- hitting ad aired shortly after London Bridge debuted. • Direct mail targeting voters in both states that takes a tongue-in-cheek approach to the transportation system crisis. Entitled "How to Survive a Col- lapsed Bridge," the literature informs voters of bridge deficiencies in their state; includes information on bridge collapses from the U.S. Army's sur- vival guide; and urges voters to con- tact Speaker Boehner and Minority Leader McConnell. 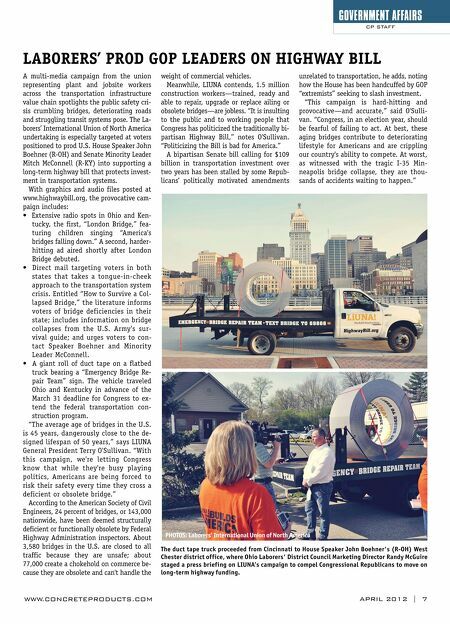 • A giant roll of duct tape on a flatbed truck bearing a "Emergency Bridge Re- pair Team" sign. The vehicle traveled Ohio and Kentucky in advance of the March 31 deadline for Congress to ex- tend the federal transportation con- struction program. "The average age of bridges in the U.S. is 45 years, dangerously close to the de- signed lifespan of 50 years," says LIUNA General President Terry O'Sullivan. "With this campaign, we're letting Congress know that while they're busy playing politics, Americans are being forced to risk their safety every time they cross a deficient or obsolete bridge." According to the American Society of Civil Engineers, 24 percent of bridges, or 143,000 nationwide, have been deemed structurally deficient or functionally obsolete by Federal Highway Administration inspectors. About 3,580 bridges in the U.S. are closed to all traffic because they are unsafe; about 77,000 create a chokehold on commerce be- cause they are obsolete and can't handle the WWW.CONCRETEPRODUCTS.COM PHOTOS: Laborers' International Union of North America The duct tape truck proceeded from Cincinnati to House Speaker John Boehner's (R-OH) West Chester district office, where Ohio Laborers' District Council Marketing Director Randy McGuire staged a press briefing on LIUNA's campaign to compel Congressional Republicans to move on long-term highway funding. APRIL 2012 | 7 weight of commercial vehicles. Meanwhile, LIUNA contends, 1.5 million construction workers—trained, ready and able to repair, upgrade or replace ailing or obsolete bridges—are jobless. "It is insulting to the public and to working people that Congress has politicized the traditionally bi- partisan Highway Bill," notes O'Sullivan. "Politicizing the Bill is bad for America." A bipartisan Senate bill calling for $109 billion in transportation investment over two years has been stalled by some Repub- licans' politically motivated amendments unrelated to transportation, he adds, noting how the House has been handcuffed by GOP "extremists" seeking to slash investment. "This campaign is hard-hitting and provocative—and accurate," said O'Sulli- van. "Congress, in an election year, should be fearful of failing to act. At best, these aging bridges contribute to deteriorating lifestyle for Americans and are crippling our country's ability to compete. At worst, as witnessed with the tragic I-35 Min- neapolis bridge collapse, they are thou- sands of accidents waiting to happen."